Entrega de los Pollos/Handing out Chickens — Where/What Time | ¡VidaMaz! Many, many thanks to all of you who attended the Desayuno de los Pollos/Breakfast of the Chickens earlier this month, who have donated money, collected clothing and toys, and who have worked hard this week packing up rice, beans, coffee, tomatoe paste, pasta, etc. 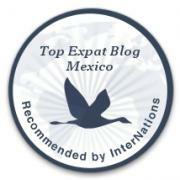 Your kindness and efforts will help improve the lives of over 2000 families in Mazatlán who are less economically fortunate than ourselves. I was over at Yolanda’s today, and they need a few more pickup trucks or even larger trucks to help us haul the frozen whole chickens. Please, if you have access to a truck and are willing to drive it on December 24th, would you contact Jorge Medina on his cell at 669-110-07-44 and let him know? Thank you! Please pass this request on to anyone you know with a truck. All who are driving: please have your trucks at Quince Letras downtown by 6:30 am on the 24th, latest by 7:00 am. Several of you have asked us what time to show up on the morning of December 24th in order to help load the trucks and deliver the goodies out to the colonias. Those who have worked in the past and know the drill, please plan to show up about 6:30 am. Those of you who are first-timers, coming by about 7:00 am will put you there just in time to help us load. We make lines of people to pass the foodstuffs/despensas into the truck, and able-bodied guys load the boxes of frozen chickens. That morning, please bring any additional used clothing in good condition that you have assembled (it’s best to take clothing over to Yolanda’s for sorting before that morning, if possible), any candy or toys you have for the kids. Donations that morning will also be welcome, as Yolanda has signed for some of the food on credit/faith. Turn East at the Fisherman’s Monument. Go to the first light and turn right. Proceed one block and turn left (Francisco Villa street, just before the Pemex station). If you are NOT driving a truck or transporting supplies, please park in the next block. This will give us room for loading. 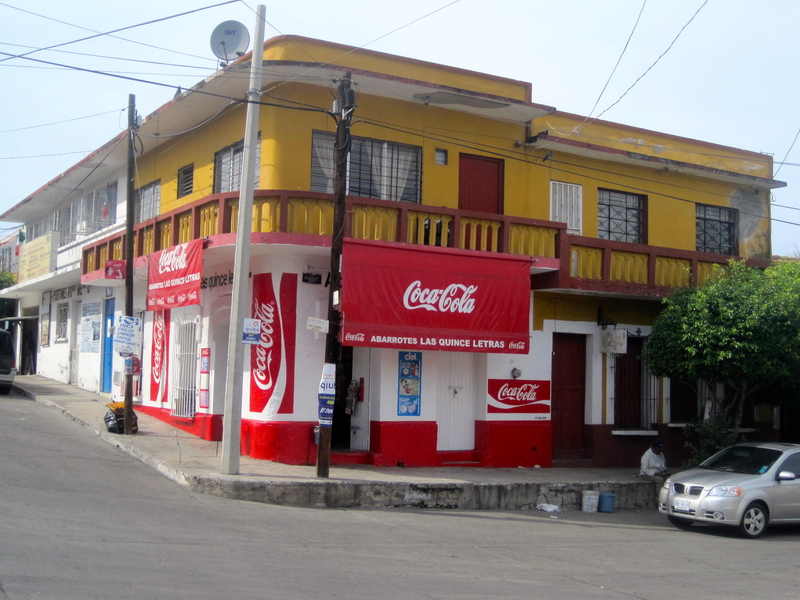 Once you’ve parked, walk another block down, past the iron works business called “Quince Letras.” On the corner of Francisco Villa and Tampico you will see a small store with a bright red “Coca Cola” hand painted on the outside, across from a tortillería. A door next to the Cocheras Automaticas business will be open. That’s Yolanda’s mother’s house, and it’s from there that we’ll be loading. If you ARE driving a truck or transporting supplies, please drive up to Tampico street (the “Coca Cola” store on your right on the corner), turn right, and park. We will be loading right there. If you can’t find it, just ask someone for “Quince Letras” or “Desayuno de los Pollos/Medina family.” Everyone in the area will know. 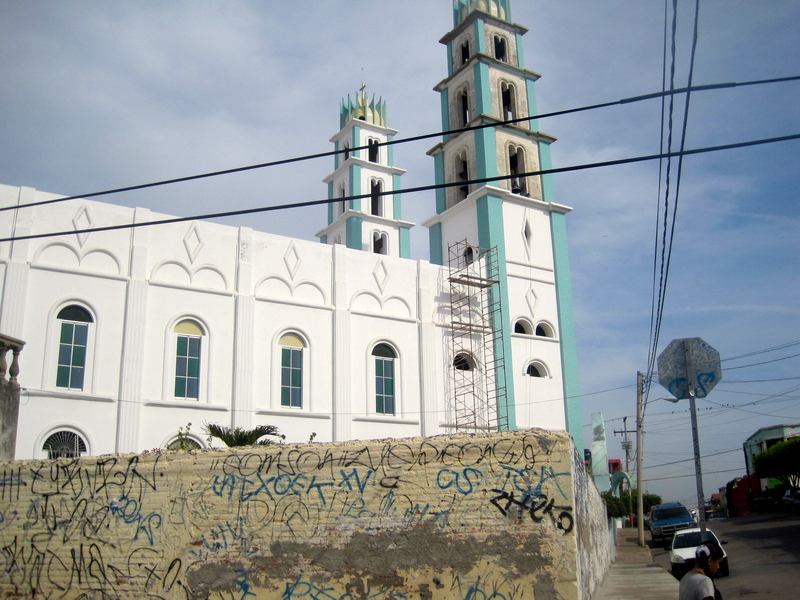 It is just down the hill from the Cristo Rey Church (photo at left). Pingback: Hometown Heroes | ¡VidaMaz!